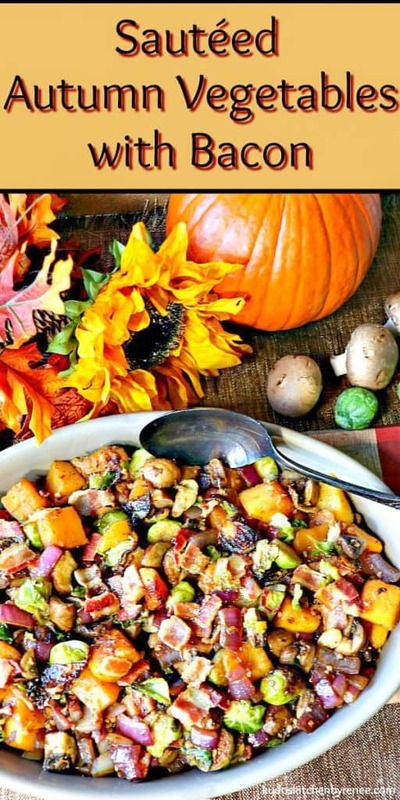 All of the colors you love about fall are in these Sautéed Autumn Vegetables which makes it the perfect side dish for your Thanksgiving or fall festival table. 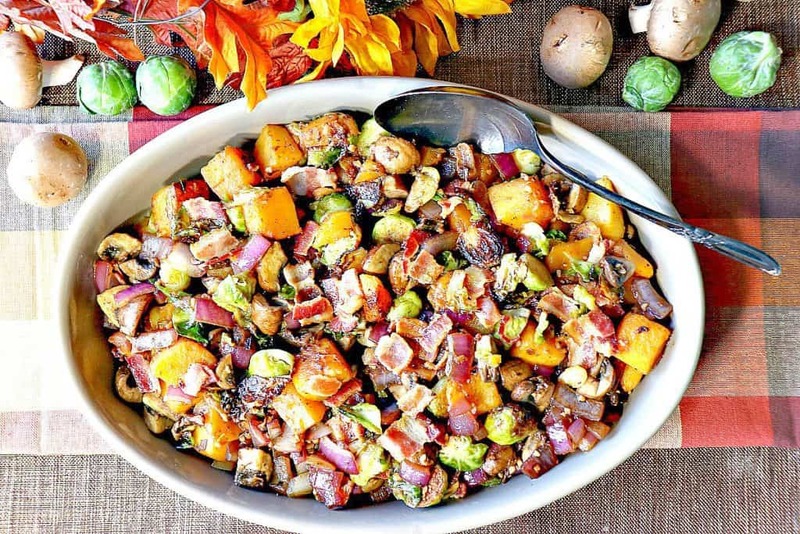 With Brussels sprouts and butternut squash being especially plentiful this time of year, I’ve come up with this delightfully colorful Sautéed Autumn Vegetables with Bacon recipe I hope you will enjoy as much as we do! 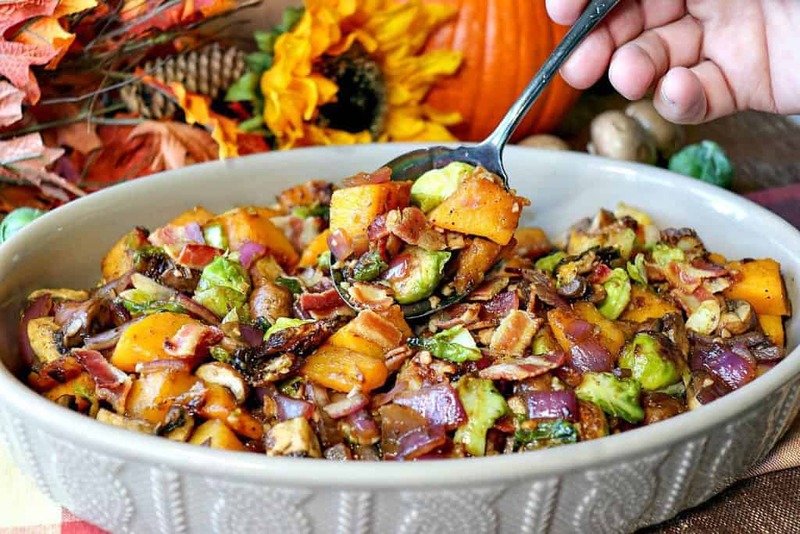 Sauteed Autumn Vegetables will make an amazing side dish to grace your Thanksgiving table, or by leaving the bacon out, you can serve this as a healthy vegetarian main course if that’s the option you’re searching for. However you serve it, I know you’re going to love all the colors, and flavors of fall. 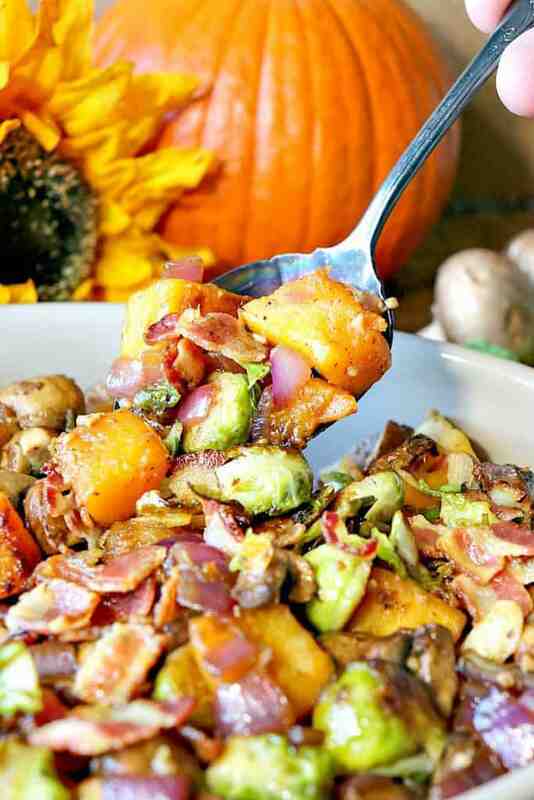 **Please Note – The printable recipe card with detailed instructions and complete ingredient measurements for making Colorful Sautéed Autumn Vegetables with Bacon is available near the end of this post. Prepare the butternut squash, Brussels sprouts, onion, and mushroom. Set aside. In a large, high sided skillet, cook the bacon until almost crisp. Remove and drain. Set aside. *Note – skip this step if preparing the vegetarian version. Add the butternut squash and Brussels sprouts to the pan with the bacon grease. *Note – If making the vegetarian version, add 2 tablespoons of avocado oil to replace the bacon grease. Sautée the Brussels sprouts and butternut squash over medium-high heat, stirring occasionally, for 5 minutes. Add the freshly grated nutmeg, salt, and pepper to the skillet and stir well. Cook an additional 1 – 2 minutes. Remove the butternut squash and Brussels sprouts to a bowl and keep warm. Add the prepared mushrooms and onions to the skillet and cook for 1-2 minutes, stirring occasionally, scraping up the fond (brown bits from the bottom of the skillet) until the onions are tender and the mushroom are browned (approximately 3 minutes). When the mushrooms are browned, stir in additional salt and pepper along with the minced garlic. Stir well. Reduce the heat to medium-low and add the cooked bacon, butternut squash, and Brussels sprouts into the skillet. Stir well and continue cooking over medium-low heat for an additional 5 minutes. Below is the printable recipe card for today’s Colorful Sautée Autumn Vegetables. If you’ve enjoyed this recipe and look forward to making it (or have already made it), I’d appreciate if you’d take a moment to give it some feedback by way of stars near the comment section at the end of this post. Thank you so much! 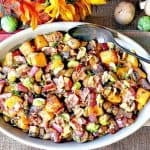 All of the colors you love about fall are in these sauteed autumn vegetables which makes this the perfect side dish for your Thanksgiving table or autumnal table. Cook the bacon in a large, high sided skillet. Remove to a bowl and set aside. Drain all but 2 tablespoons of the bacon fat from the skillet. Add the Brussels sprouts and butternut squash to the skillet along with the bacon fat, salt, and pepper. Cook the sprouts and squash over medium-high heat, stirring occasionally for approximately 7-10 minutes. Stir in the garlic and nutmeg. Remove the sprouts and squash to the bowl with the bacon and set aside. Add the onion and portobellos to the skillet and cook, stirring occasionally, for 5 - 7 minutes. Add the butternut squash, Brussels sprouts, and bacon back into the skillet with the onions and mushrooms. Reduce the heat to medium-low. Cook, stirring occasionally for an additional 5 minutes. 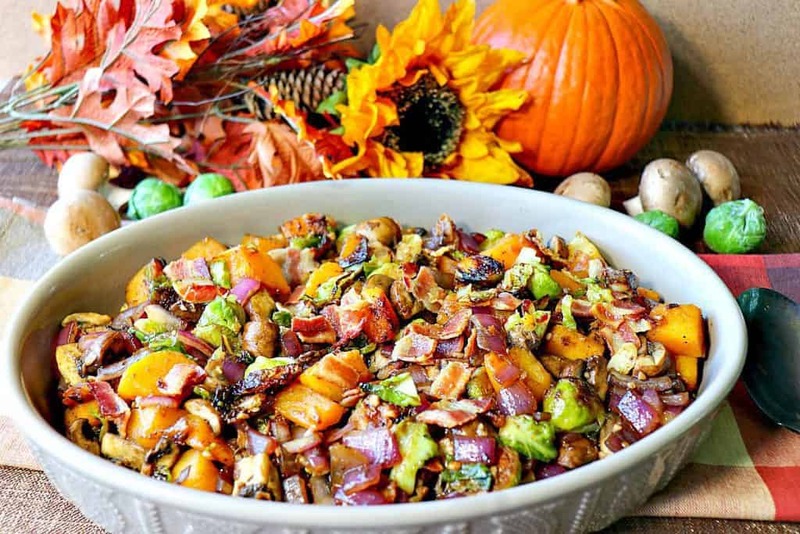 I sincerely hope you’ve enjoyed today’s fall festival recipe for Colorful Sautéed Autumn Vegetables with Bacon as much as I’ve enjoyed bringing it to you! This salad is sooooo good! The bacon totally makes it! This sounds delicious and just what I need to add to our holiday menu. It cooks up a lot faster than roasting the vegetables in the oven and that’s a plus. And I bet the crispy onions and pumpkin seeds on top would be the perfect touch. I wish I would have thought about the crispy onion topping or the pumpkin seeds before I wrote the post. LOL. Next time. Amazing flavors! I could make a meal of just this! LOL. I can, and I have! omg this salad is the stuff my fall dreams are made of!! There’s nothing not to love about this and it’s a must-make for Thanksgiving and any other fall gatherings! I agree! Glad you’ve enjoyed this recipe! Thanks. I will be making this for Thanksgiving dinner. I was never a fan of red onion, so my question is… what would compliment this dish the beast as a substitue for red onion, shallots or yellow onion? Personally, I would go with shallots. Yellow onion, eaten raw, can be overpowering. Shallots will be milder and will complement the salad nicely. Great question. Thanks for asking and enjoy the salad!! Happy Thanksgiving, Terri! !